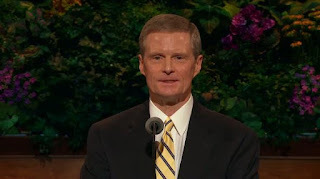 Elder David A. Bednar of the Quorum of the Twelve Apostles delivered the definitive address on the Lord's law governing chastity. Our mortal life is to provide experience. A physical body is part of that provision. (1 Nephi 19:6; Alma 7:12–13). Man and woman are intended to complement each other. The unique spiritual, physical, mental, and emotional capacities of both males and females is necessary to fulfil Heavenly Father's plan. “Neither is the man without the woman, neither the woman without the man, in the Lord” (1 Corinthians 11:11). God's commandment to multiply and replenish the earth remains in force today. Thus, marriage between a man and a woman is the authorized channel through which premortal spirits enter mortality. Complete sexual abstinence before marriage and total fidelity within marriage protect the sanctity of this sacred covenant. Rules that are part of God's plan are spiritual in nature, and are intended to guard from misuse of the procreative power that is entrusted to us by God the Father and Jesus Christ. Outside the bonds of marriage, all uses of the procreative power are to one degree or another a sinful degrading and perversion of the most divine attribute of men and women. (“The Great Plan of Happiness"). The Church follows one uniform rule guarding this procreative power. For every individual, man or woman, the standard for sexual morality dictates that sexual intimacy is proper only within legitimate marriage as provided in God's plan. Such relations are not merely a curiosity to be explored, an appetite to be satisfied, or a type of recreation or entertainment to be pursued selfishly. They are not a conquest to be achieved or simply an act to be performed. Rather, they are in mortality one of the ultimate expressions of our divine nature and potential and a way of strengthening emotional and spiritual bonds between husband and wife. To some extent, the 'natural man" characterized in the Book of Mormon is a part of each of us. As President Spencer W. Kimball described, "...The ‘natural man’ is the ‘earthy man’ who has allowed rude animal passions to overshadow his spiritual inclinations". As children of our Heavenly Father, we inherit divine capacities. But we must also govern our natural passions and appetites in favor of our inclination toward selfless benevolence and temperance. We live in a fallen world, and the very elements from which we came are corruptible, and leave us subject to sin and death. That is the test. Every appetite, desire, propensity, and impulse of the natural man may be overcome by and through the Atonement of Jesus Christ. We are here on the earth to develop godlike qualities, and to bridle all of the passions of the flesh. The devil, Lucifer, desires to frustrate God's "Plan of Happiness" and to make the sons and daughters of God confused and unhappy, to interfere with their eternal progression. This constitutes rebellion and defiance against the plan of God. Lucifer seeks to limit our progression by tempting us to use our bodies improperly. Disciplining the natural man in each of us makes possible a richer, a deeper, and a more enduring love of God and of His children. Love increases through righteous restraint and decreases through impulsive indulgence. Let virtue garnish thy thoughts unceasingly; then shall thy confidence wax strong in the presence of God (D&C 121:45). Sin is as a "spiritual wound" that some need to repent of. From the Atonement of the Savior arises the comforting power that can heal our spiritual wounds and remove guilt. However, this can only be applied through the principles of faith in the Lord Jesus Christ, repentance, and consistent obedience. The bishop holds the key to repentance to assuage our guilt. The extent and intensity of your repentance must be equivalent to the severity of your sins. Serious spiritual wounds require sustained treatment and time to heal completely and fully.